There was a little snippet in the paper the other day about the optimistic expectations of commercial vegetable growers this year. 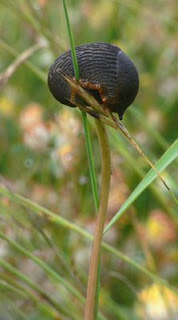 They are hoping that the temperatures during the recent cold snap were low enough (to penetrate to a sufficient soil depth) and had lasted long enough to cause significant damage to overwintering populations of slugs and snails that they felt had built up to virtually plague proportions in recent years. This made me think of observations I have made over recent years monitoring the vegetation on the local downs. Two species of orchid, Man Orchid (Orchis anthropophorum) and Greater Butterfly Orchid (Platanthera chlorantha), have been doing really well albeit from a low base. They can be counted early in the year because they start into growth around the end of January before grasses get going and the populations have been increasing nicely. Until two years ago this increase was also reflected in the number of flower spikes for each species but in 2007 there was a large drop in numbers of spikes and in 2008 there were hardly any mature spikes of either species in May/June. In both cases this appeared to be due to slug and snail predation during damp spells in April/early May, immature stems collapsing after being half eaten away longitudinally, every gardener know the symptoms. So like the vegetable growers, with the cold spell and possibly a dryish spring perhaps we can look forward to a decent display of orchids this year. 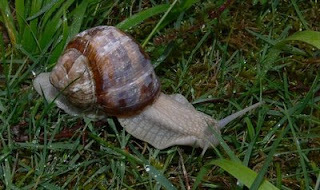 I must admit until these observations, it had never really occurred to me the effect these gastropods have in the wild and on Chipstead Downs it is potentially even worse because we have Roman Snails (Helix pomatia)!! Anyone else any thoughts? Yikes!! I hate slugs and snails around orchids. Just returned from walk on Chipstead downs - not one slug or snail in sight. But maybe they've all been stolen for gourmet restaurants - there's a notice on a gate urging walkers to look out for Roman snail thieves! Good news for the orchids!